A rich, chocolaty, moist, easy-to-make, one bowl chocolate cake made with mayonnaise instead of butter and eggs. 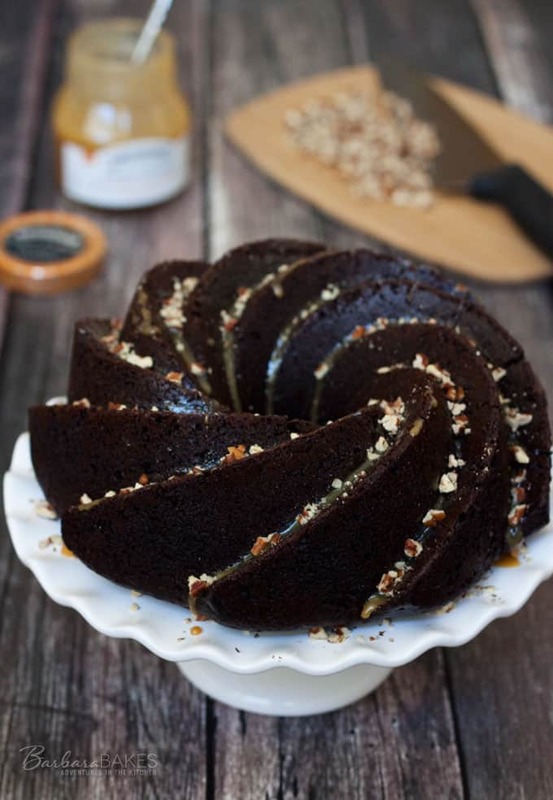 This chocolate mayonnaise cake made in a bundt pan is an old fashioned treat that you’ll want to make often. My grandma was a sweet, quiet lady, who loved to collect recipes. She passed away decades ago, but we still have her recipe collection, and tucked in with her other favorite saved recipes was a recipe for a $100 cake. The history of the $100 cake is similar to the Niemann Marcus cookie recipe. Someone was charged an exorbitant amount of money for a recipe from a restaurant, and so they shared it with everyone. After looking at the ingredients though, I believe it’s more commonly known as a Chocolate Mayonnaise Cake, or a depression era cake. When butter and eggs were scarce you could substitute mayonnaise, which is made from eggs, oil, and a little vinegar, and still bake a rich, delicious cake for a special celebration. I love the ease of making this recipe. You don’t need a mixer. Just mix your dry ingredients in a large mixing bowl, and make a well in the center. Then all you need to do is add your liquid ingredients and mix until the batter is well blended. Since I bake a lot of bundt cakes, I decided to buy a fun, new swirly Heritage Bundt Pan. 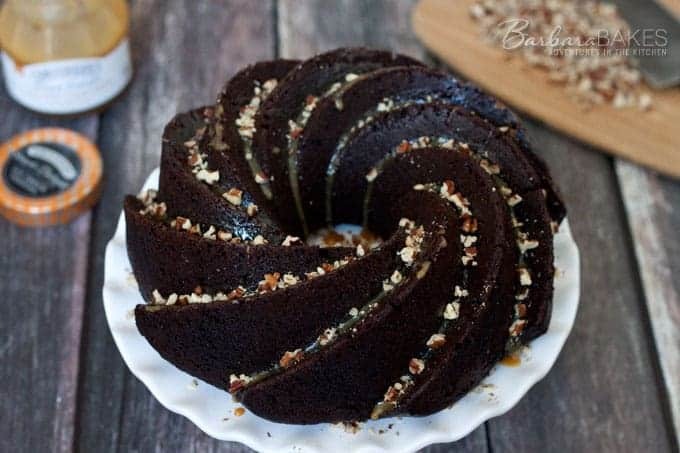 The bundt pan only holds 10 cups of batter, so this cake was perfect since the recipe originally made an 8-inch round cake. I decided to top the cake simply with some Smucker’s Salted Caramel and some chopped toasted pecans. 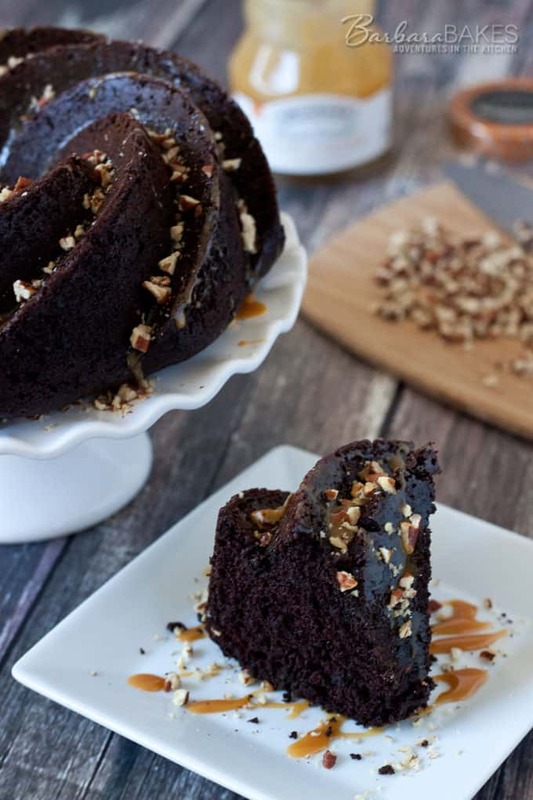 The cake is so rich, moist and delicious that it doesn’t really need any topping at all. In a large mixing bowl, whisk together flour, sugar, cocoa, baking soda, and salt. Make a well in the middle of the dry ingredients, add mayonnaise, cold water and vanilla. Mix until well blended. Pour into greased and floured 10 cup Bundt pan (I used baking spray with flour.) Bake for 35 minutes or until a toothpick comes out clean. THIS CAKE IS AMAZING…made it in my new bundt pan and just dusted with sugar, unbelievably moist and the easiest cake I’ve ever made. Thank you so much. I just finished this cake, my husband tasted it and it went straight in the trash! Awful!! Sorry you didn’t enjoy it. It’s a classic cake, perhaps you changed something or forgot an ingredient. I made a mistake and measured before sifting. I wonder if that will ruin it. Was it the texture or flavor or both? Shouldn’t make a big difference unless you packed the flour into the cup. Hope you enjoy it. I beat and added an egg to the first cake. It was heavy but the group ate the whole thing in one sitting. I am making it again following the directions this time. I melt a dark chocolate bar in the doubled boiler and drizzled for a topping then made a vanilla icing and poured that on top as well. This time I will use a red icing since it will be eaten by Vampire table-top role playing gamers. Hello again, this cake turned out quite well in a flat pan. I love the recipe. I now use it all the time! Thank you! I made this and it turned out great! It got rave reviews. I am making it again right now but in a flat pan. Curious to see the results. Thank you. Thanks Fani! You’ll have to let me know how it turns out in a 9×13 pan. I needed a last minute cake to take to take to an end of school picnic today. Had no eggs or butter or time and found this recipe. Started this cake at 8am and had this DONE by 9am. It was one of the first deserts that disappeared! I used coffee for the water and Hershey’s’ Dark Cocoa. Delicious. I will def make again! Thank you. Thanks Maria! That’s so fun. I’m glad it was a hit. I made this cake for the first time on mothers 5/8/16 it came out so moist and delicious I can’t wait to make it again . As I was making it I thought of using coffee instead of water like I usually make my chocolate cakes with . Next time I will try that . A must keep recipe !!! Thanks Brandie – glad you enjoyed it. I like the idea of using coffee instead of water. I have this recipe from my Mom – she always called it the Waldorf Astoria cake. She claimed it was developed at the Waldorf in New York, during the Depression because of rationing. It was my Dad’s favorite cake, so we often had it with a good amount of chocolate buttercream frosting on it!! I have also made it many times over the years! Hi Susan – that’s a fun story. Thanks for sharing. Coffee instead of water adds a richness of flavor that we really love. That was my first thought too! Can’t wait to go home and try it this evening. I’m also considering making mug cakes with this recipe….. cutting it to one fourth and microwaving. Hubby likes desserts but I don’t need a whole cake tempting me. 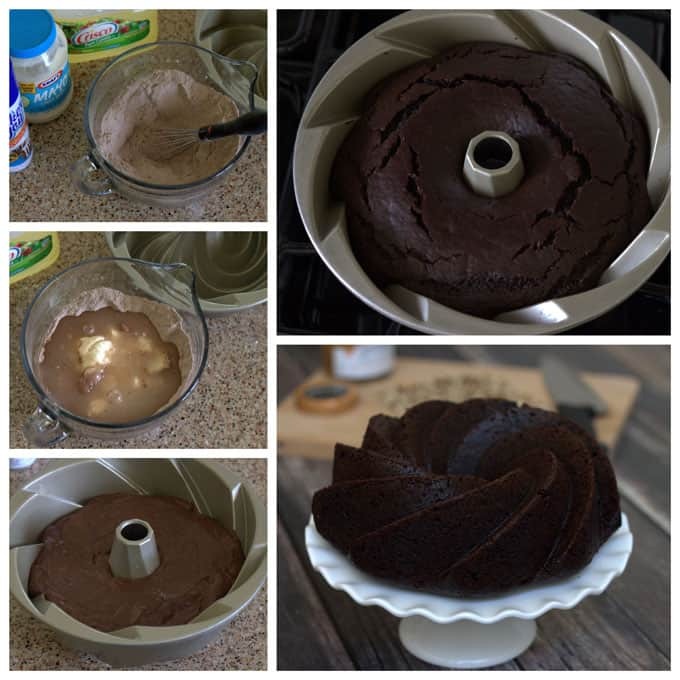 To fill the bundt pan double this recipe and increase baking time to 50 minutes or when toothpick comes clean in center. I haven’t tried this, if you do just be sure not to fill the pan more than 2/3 full. Sorry Jenelle – sounds to me like you forgot to add the sugar, or perhaps you used Dutch-process cocoa? Thanks Olga – I haven’t tried it, but I don’t see any reason you couldn’t use milk instead of water. Let me know how it goes. Nordic Ware sent me a Blossom Bundt pan to replace a Bavaria pan that I was extremely dissatisfied with the pan because of the dark teflon coating. I always had a very crusty cake. I believe the Blossom pan is a 10-cup pan also. I may give this recipe a try. Do you think it would work in a 6-cup pan? You can try it. Only fill the pan 2/3’s full and then if there’s extra batter, bake it in mini loaf pans. thanks ator this amazng recipe > but i awant to ask you 350° mean ° C or ° F ? wow this cake looks amazing but i want to know if I used all-purpose flour i will use the same amount or i must use 1 and 3/4 cup filour with 1/4 cup cornstarch . Thanks Justine – you can use the same amount of all purpose flour. The cake will be just a little more dense. Mom’s recipe called for 2 scant cups of all purpose flour – take a tablespoon out of each cup to make it scant. I am wondering can you use miracle whip instead of mayo? I like Miracle Whip but don’t think it would work in this recipe. Due to budget concerns making this cake about every 2 – 4 weeks, Mom always used the cheapest salad dressing she could find. She never used her Helmann’s!!!! So you could probably make it with Miracle Whip, as it is considered a salad dressing instead of a mayo!! Hi, can I make this with all purpose four, I dont have cake flour ? Hi – you could use all purpose flour, or you could also make cake flour but using 1 34/ cup all purpose flour and whisking it with 1/4 cup cornstarch. I am definitely making this! I have the recipe in an old cookbook and have always been intrigued but never made it yet. It looks amazing! Chocolaty and so moist! Bookmarked for when my son gets home! And love the topping!